This wiki has been developed to allow members of the bat conservation community to share and discuss practices to mitigate threats facing bats in North America. It is managed and maintained by the North American Bat Conservation Alliance, a coalition of regional bat working groups from Canada, the USA and Mexico. The Steering Committee of the North American Bat Conservation Alliance developed a list of 21 potential threats facing bats in North America. The threats were categorized based on the established IUCN–CMP Threats and Actions Classifications. These classifications provide a framework for organizing threats and conservation actions using a common language. The development of this list was also informed by compiling the materials collected from approximately 400 participants at the North American Joint Bat Working Group Meeting held in Saint Louis, Missouri, March 3-6, 2015. 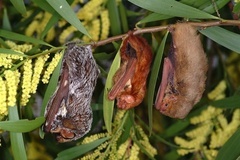 At this meeting, bat experts from across the continent were separated into groups of 8-12 people and asked a series of questions to compile a list of the threats to bats in North America. In 2016, an electronic survey was sent to all regional bat working group participants asking for their input to rank the threats in their region of expertise. The information from this survey was used to identify which are the highest priority threats (i.e., those affecting a high proportion of the population or one or more species, and having a large impact on the populations they do affect), to help with prioritizing conservation actions. This Wiki was developed primarily to allow experts to share information on approaches for mitigating these threats. Please help contribute your information on ways to help conserve North America's bats. Click on the Identifying Threats tab on the top menu bar to view how the 21 threats to bats of North America were identified and prioritized. Click on the Addressing Threats tab on the top menu bar to read and contribute more details on the impact of each threat, and conservation actions that can be taken to address them.